La metropole is experiencing a renaissance and many lawyers are benefitting. Montreal has long been Canada’s capital of chic and cool. But high unemployment, crumbling infrastructures and front-page corruption cases have in recent years tarnished the city’s image as a world-class place to live, work and do business. But suddenly, with little fanfare, Montreal has bid adieu to the bad times. One indicator is the city’s jobless rate. It fell to 7.3 per cent in 2016, the lowest level since Statistics Canada started tracking numbers in 1987. Similarly, more than one million people were working in la métropole in December, an all-time employment high in the city’s 375-year history. Economists credit a perfect storm of factors for the sudden turnaround. They include a low dollar, affordable housing and a slew of major publicity campaigns and public works projects tied to Montreal’s milestone birthday celebrations this year. The result has been upswings in public confidence, private investment and demand for the services of lawyers and other white-collar professionals in several sectors, including manufacturing, finance, technologies, culture and construction. “There is clearly a buzz in the city that is being driven by all kinds of things,” said Karl Tabbakh, managing partner of McCarthy Tétrault LLP’s operations in Quebec, which revolve around the 140 lawyers who work in the firm’s flagship office in downtown Montreal, next to the Bell Centre. In addition to the positive attitude and decisive actions of Montreal Mayor Denis Coderre, which he says have helped city residents “turn the page” on the widespread corruption at city hall that was exposed by the Charbonneau Commission of Inquiry on the Awarding and Management of Public Contracts in the Construction Industry, Tabbakh says the many major infrastructure projects going on across the city have electrified entrepreneurs. “There is an energy among them, and we feel it,” said Tabbakh. “The city skyline is filled with highrises and cranes. That’s a good barometer of the economic activity. And it’s not just construction. We’re very bullish on Montreal and the Quebec economy as a whole. Carolena Gordon, a partner in Clyde & Co’s Montreal office, has a front-row view of all the action from her office on the 17th-floor of a highrise that overlooks the city centre and the McGill University campus. She adds that Montreal’s flourishing life sciences sector is also driving demand for a whole slate of legal services involving trademarks, intellectual property, employment and labour law. Gordon believes the city’s current hot economic climate has also been stoked by a clearer vision of political and corporate governance in Quebec as a result of the Charbonneau Commission. For his part, Jean-François Gagnon, chief executive officer of Langlois lawyers LLP, is equally upbeat about Montreal’s economic performance of late. “Things are extremely dynamic right now and will remain like that for many years to come,” says Gagnon, who moved to Montreal from Quebec City in 2006 when his firmmerged with Langlois. He notably credits the city’s burgeoning construction industry for driving demand for construction law services. In addition to condo and other residential projects, he pointed to several multi-billion-dollar projects, including the building of the McGill and Université de Montréal mega hospitals and the construction of the new Champlain Bridge. He called the latter “a veritable benediction for many law firms” in everything from contract writing, litigation and arbitration to negotiations and even expropriations. Like Montreal’s skyline, Gagnon says the city’s legal landscape is also undergoing a renaissance of sorts these days. “The legal scene in Montreal is extremely effervescent and dynamic, but it is also changing,” he says. Unlike a generation ago, when a dozen national and big regional firms ensconced in marble- and leather-laden offices that occupied several floors of downtown highrises monopolized big transactions and litigation, Gagnon says the Montreal legal market has become far less stratified. “Big national firms are less adapted for the Quebec market, which is less sophisticated than other big Canadian cities, though that is changing,” says Gagnon. He says the political- and economic-inspired departures of several large company headquarters have resulted in fewer large commercial transactions taking place in la Métropole. “That impacts on the positioning and competitiveness of big firms that charge $600 an hour compared to a regional firm like ours that charges $400 for the same services,” says Gagnon. 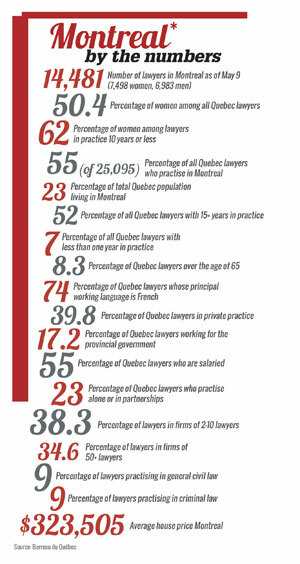 The result, says Gagnon, is a readjustment that is resulting in a more competitive landscape among lawyers in Montreal. “Big firms will feel the fee pressures from their higher rates and costs and more competition from smaller firms, and the smaller firms will become bigger and recruit away from the big firms,” says Gagnon. “That’s our plan anyway. Benjamin David Gross, a partner with Lavery Lawyers, the largest regional law firm in Quebec, has an equally sunny forecast for Montreal’s legal climate. In addition to being involved in many of the big construction jobs going around the city, including the super hospitals, the Champlain Bridge and the new Radio-Canada building, century-old Lavery is well positioned to compete on its home turf for all manner of business law work against both national and international firms, says Gross. “We have offices in every major centre across Quebec,” says Gross, noting that the firm, with its 200 lawyers (50 of whom joined from Heenan Blaikie after the once-prominent national firm folded in 2014), is running “neck and neck” with Norton Rose Fulbright LLP as the biggest law firm in la belle province. Gross also praises both the quality of lawyers and the practice of law in Montreal, a highly multicultural city with a dynamic cultural life, great restaurants, world-class museums, five universities and a relatively low crime rate. “Like probably every other lawyer in this office, I have two law degrees and I’m bilingual,” says Gross. “We operate in two different legal systems that work hand in hand here, trying to harmonize. I can and do work on deals with pieces all over the world, and because of the situation here, I get a feel for law elsewhere. For Simon Tremblay, the outgoing president of the Montreal bar and a litigation lawyer who became a celebrity across Quebec for his role as assistant counsel in the Charbonneau Commission, the corporate legal scene in Montreal is undergoing a transformation. For McCarthy Tétrault’s Tabbakh, the increased competitiveness of the Montreal market is also resulting in a segmenting among top-tier firms, which he puts in three buckets: elite firms with high-stakes mergers and acquisitions and big litigation; groups of firms joining international firms to become full-service business law firms; and boutique firms that specialize in specific areas. “If you’re not in one of those you will not be able to attract the same talent to succeed in the market and offer services to your client,” he says. Other challenges also cloud Montreal’s otherwise sunny legal skies. One is restricted access to justice, which hinders Montreal firms’ efforts to deliver streamlined services that respond to client requests for combined costs and quicker responses. She praises a spate of recent measures meant to speed up proceedings in both civil and criminal trials in Quebec. 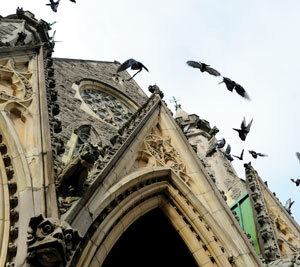 A major reform is the new Quebec Civil Code of Procedures. Introduced on Jan. 1, 2016, it makes the search for settlements through alternative dispute resolution mechanics an obligation on judges, who are in turn pushing litigants to reach settlements and avoid trials. Widely praised as a major improvement in access to justice, the change has nonetheless hurt small litigation and general business law firms in Montreal, like elsewhere in Quebec. According to Richard, the new Civil Code of Procedures has given rise to a new way of doing things that is hitting his bottom line hard.